Before man devised instruments to track time, the ancients measured their days by the movement of the sun across the sky, and their seasons by the subtly shifting position of the stars twinkling in the night firmament. 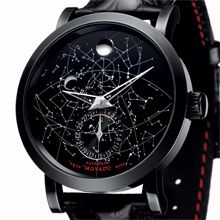 For 2012, Movado – renowned for its iconic Museum® dial defined by a single dot at 12 symbolizing the sun at high noon – presents the Red Label Skymap™. This sophisticated limited production automatic timepiece combines the finest in Swiss-calibrated timekeeping with the heavenly, awe-inspiring, timeless imagery of the constellations. Offered in polished solid or black PVD-finished stainless steel and topped by a flat sapphire crystal, the simple round 42mm case houses a fine 21-jewel Sellita automatic movement with added Dubois-Depraz moon phase complication and signature red Movado “M” rotor. The elegant workings of the mechanism may be seen and appreciated through the sapphire crystal exhibition case-back. 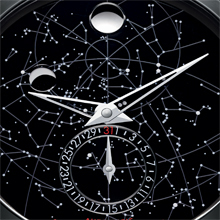 Exquisitely mapped with the stars of Switzerland’s summer sky, the larger ones set aglow with Super Lumi-Nova®, the breathtaking dial – a limited production in black, or special edition in blue or grey – is detailed by a small moon phase window at 10 o’clock, a date indicator subdial at 6 o’clock, thin silver-toned skeleton hands and Movado’s signature concave dot at 12 o’clock, and red lettering. The glossy black or matte blue or grey genuine alligator strap matches the color of the dial. It secures to the wrist with a classic tongue buckle in the same finish as the case. Mechanical, self-winding Sellita caliber SW300 with Dubois-Depraz DD9234 complication; 21 jewels; custom-designed rotor with red Movado “M” silhouette. 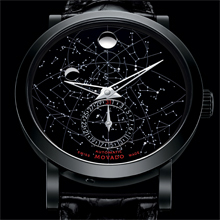 Artist-rendered black, blue or grey graphic dial mapped with the constellations of Switzerland’s summer sky; with Super Lumi-Nova star detail, moon-phase window at 10 o’clock, date indicator subdial at 6 o’clock, silver-toned skeleton dauphine hands, Movado’s signature rhodium-plated concave dot at 12 o’clock, red lettering. Round black PVD-finished or polished stainless steel case with matching crown embossed with a black PVD “M” logo, sapphire crystal exhibition case-back. Flat, scratch-resistant sapphire crystal. Water resistant to 3 ATM. Glossy black, matte blue or matte grey genuine alligator strap with black PVD or polished steel classic tongue buckle.